Study abroad is increasingly becoming a significant part of the world’s education sector, and a report by the OECD concluded that United States, Australia, Canada, France, Germany and the United Kingdom together receive over 50% of all foreign students in the world (OECD, 2014). Of these, the United States continues to be the top destination of choice for Danes studying abroad (Statistics Denmark, 2015). The Danish Government aims to see at least 50% of all Danish students study abroad during their higher education (Ministry of Higher Education and Science, 2013). However, students studying in the United States face both high tuition fees and cost of living. As a result, the cost of foreign education in the United States is not fully funded by the Danish Government and many Danish foundations have emerged to help defray the cost of foreign education for Danish students. Overall, Denmark has become home to an estimated 15,000 foundations, many of which are committed to the support of foreign education for Danish students. These foundations provide great opportunities for Danish students wanting to finance their education in the United States. This article aims to highlight some of the domestic and international scholarships available for Danish students wanting to study in United States. Please consult the individual organizations for details regarding application criteria and deadlines. The Fulbright scholarship is an American scholarship program. It was founded by former American Senator, James William Fulbright (born April 9, 1905, Sumner, Missouri, U.S.—died Feb. 9, 1995, Washington, District of Columbia). Serving as senator for three decades from 1944, J. William Fulbright was an outspoken critic of United States foreign policy during the cold war. Fulbright’s seminal 1946 legislation facilitated the establishment of the Fulbright Program, which continues to significantly promote mutual understanding and bilateral relationships between the United States and many other countries (Bureau Of Educational And Cultural Affairs, n.d.). The Danish-American Fulbright Commission was established to make grants for Danish citizens residing in Denmark who wish to attend graduate studies or conduct research in the United States. The Fullbright Center in Denmark has been instrumental in advising Danish students wanting to study in the United States, and the Fulbright remains a trend-setting scholarship program that is recognized worldwide. Winners of the prestigious scholarship are often admired around the world. The commission offers a variety of grants, with several requirements that must be met to qualify for support. Some of these requirements are outlined below. Fulbright Master Scholarship. This program is open to students in exchange programs and full programs at the graduate level. The scholarship requires students to be subject to tuition fees at an American university or college in order to be eligible for support. The Fulbright Ph.D. Scholarship. This scholarship is open to Ph.D. students in American universities. Students may either be accepted through graduate admission to full Ph.D. programs or complete “non-degree” Ph.D. programs as part of their Danish Ph.D. program. 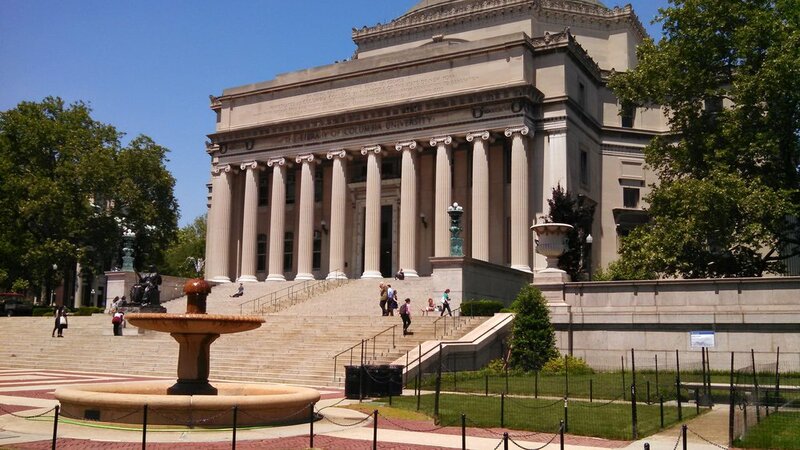 Columbia University, Graduate School of Arts And Sciences. This joint grant is open for Master’s Degree and Ph.D. students to study one year at the renowned Ivy League school, Columbia University. As of writing, the joint grant offers a tuition reduction for Master’s Degree students, while Ph.D. students can obtain a full tuition waiver. As a student focused on achieving the maximum possible benefits of a degree and gaining in-depth understanding of the academic topics studied, studying at Columbia University can be a once-in-a-lifetime experience with a lasting impact on your professional career. New York University, Graduate School of Arts and Science. This joint grant is open to Master’s Degree and Ph.D. students to study for one year. In practice, the joint grant operates as a tuition reduction, as the commission subsidizes part of the tuition fee. The studying environment allows students to progress academically, supported by the fine educational service being offered by New York University. The American-Scandinavian Foundation is a nonprofit organization founded in 1911 to promote study abroad and cultural exchange between the United States and the five Nordic countries: Denmark, Finland, Iceland, Norway, and Sweden. Operating from New York City’s Scandinavian House, the foundation primarily derives the funds for its grants and scholarships from the contributions of corporations, foundations and, occasionally, government (The American-Scandinavian Foundation, 2015). Rebild National Park Society, Inc. is a Danish-American friendship organization, also known as the “Rebild Organization”, that works to strengthen transatlantic relations between Denmark and the United States through a range of cultural activities. The organization has members on both sides of the Atlantic. Formed in the wake of the mass migration in the seven decades following 1850 that saw 300,000 workers leave Denmark for the United States, the Rebild Organisation was founded in 1912 by a group of Danish Americans who purchased 80 hectares of land in Rebild, Denmark. The site became a hub for celebrating America’s Independence Day among Danish families and immigrants from many other nations. Today, the Rebild Organization administers three scholarship programs, also known as “Rebild Scholarships”. This bilateral scholarship program is open to Danish students in higher education in the United States and American students studying in Denmark. Historically these scholarships have been awarded at the Rebild Organization’s annual event (Rebildfesten). William S. Knudsen and Clara Elisabeth Knudsen Rebild Foundation. This scholarship was named after William S. Knudsen, Signius Vilhelm Poul Knudsen, (born 25 March 1879 in Copenhagen - died 27 April, 1948 in Detroit) who was a Danish-born American automotive industry executive. Knudsen is regarded as one of the most influential Danish-born individuals in United States history (Alsted, 1979). After migrating to the United States in 1900 in his early twenties, Knudsen started work as a shipyard riveter and later worked at the Keim Mills bicycle factory in Buffalo, where he quickly excelled as a leader in business. Following the Ford company’s acquisition of Keim Mills in 1911, William S. Knudsen made a career at Ford and began supervising the automobile establishment at its operations throughout the United States (ibid). During World War I, he led a team of production engineers in charge of Ford Motor Company’s construction of submarine patrol boats and other war matériel for the U.S. Navy. Although he left Ford in 1921, Knudsen continued to impact the automotive industry through his work at General Motors, where he became President in 1937. Continuing to support the US war effort throughout World War II, Knudsen led the U.S. Office of Production Management and later became a Lieutenant overseeing the production of war matériel for the War Department, before returning to the private sector in 1945 (Smith, M. R. (Ed.). 1985). The 1000 $ Foundation. Formally: 1000 Dollar Fonden Rebild, is a Danish-American bilateral scholarship forming part of the Rebild Scholarships program under the administration of the Rebild Organization. Diana og Irenes Foundation. A Danish-American bilateral scholarship composing part of the Rebild Scholarships program under the administration of the Rebild Organization. Little is known about this medical program scholarship. Research reveals that the foundation has made grants to medical specialists in orthopedic surgery and clinical microbiology as well as medicine students in graduate school writing their dissertations within these medical disciplines. The committee commonly comprises Danish medical doctors in the university hospitals of Denmark. This article focuses on some trend-setting foundations supporting Danish students in the United States. It is beyond the scope of this article to provide an exhaustive list of all scholarships which are potentially available to Danish students in the United States. Such a list would be very extensive because financial support for education by Danish foundations is not merely based on students’ intended study location. Instead, Danish scholarships are awarded based on a diversified array of academic, demographic and social factors. This article analyses a few trend-setting scholarships governed by rules, procedures and by-laws of their own charters, which focus attention on the support of education in the United States for Danish students. The scholarships in this article are not likely to cover all educational expenses in the United States. A typical student applies for several scholarships in order to receive any financial support, and Ms. Cecilie Maria Haurits Nielsen serves as a great Danish example of success. She applied for nearly one-hundred relevant scholarships in order to fund her graduate degree at New York University and in turn received DKK 375.000 (USD 60.000) from an assortment of domestic and international foundations, including from the American Fulbright Scholar Program, according to her interview. This article does not provide updated information about scholarships or their application criteria. Rather, this article is a review of some foundations that historically have focused on supporting Danish students’ education in the United States. It is difficult to provide an accurate picture of scholarship procedures in particular, as foundations and scholarships regularly make changes to their addresses, procedures, and scope of support. Therefore, we encourage students wanting to apply for scholarships to verify all application details and their eligibility exhaustively via the individual foundations and grant-makers prior to applying for their support, or to use our grant-finding service for Danes here at Fundraising.how. While the United States is the preferred destination for Danish higher education students studying abroad (Statistics Denmark, 2015), the country poses dual challenges of high tuition fees and an elevated cost of living. The Danish Government has set a target of 50% or more of Danish students undertaking part of their higher studies abroad (Ministry of Higher Education and Science, 2013), however it does not fully fund the costs of foreign education of Danish students. Participating in the initiative would be prohibitive for many students without the support of the numerous foundations committed to the support of Danish students undertaking study abroad. In highlighting a sample of trend-setting foundations supporting Danish students’ higher education in the United States, this article aims to demonstrate the wealth of educational possibilities available to Danish students abroad. students studying abroad has almost doubled in five years). Statistics Denmark. Copenhagen. Online version accessed November 15, 2016. OECD (2014), Education at a Glance 2014: OECD Indicators, OECD Publishing.